Analytics and A-B Split Testing relate to many facets of zooming-in on fast results, including long-term results. Just take colors for instance… Bammo has observed (well, maybe you know this already) to note that a simple ‘sliver’ of analytics provide a ‘wealth’ of information. Colors have been on many of researchers list for quite awhile. As a side bar and adjunct to our membership chapter content, one will find that A-B Split testing (just) colors alone on… fonts, graphics, backgrounds, foregrounds, et. al. will establish some interesting and powerful results, indeed. It’s kinda interesting to play around with the notion of actually knowing, or at least reaching your buyers, even if it’s just a sliver, as it relates to many other reasons your customer will consider your business. Psychology is one of the most important aspects in marketing that we all tend to overlook. From messaging to color, it’s the small details that can persuade you to either purchase or walk away. 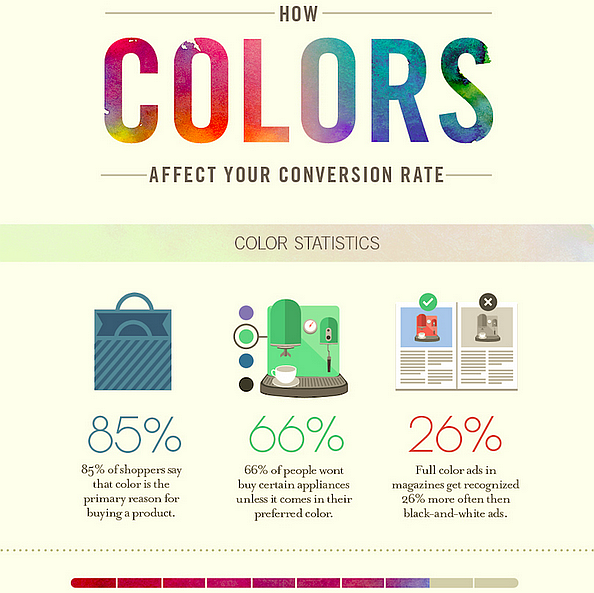 Did you know that color accounts for 85% of the reason why you purchased a specific product? Or that full-colored ads in magazines are recognized 26% more than black and white ads?